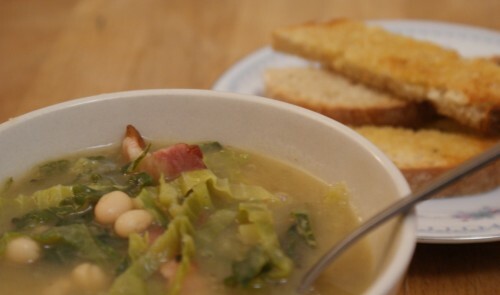 This is a hearty and healthy soup perfect for a chilly wintry day. Even better with lots of toasted potato bread slathered in buttered. I came up with this to use up yet more cabbage, along with various odds and ends in the vegetable basket. The base is a simple vegetable soup, and here lies the beauty as you can use whatever vegetables you have to hand, we used leeks and potato, but carrot, parsnip or celery would all work equally well. Blend it up, add the finely chopped cabbage and simmer for about 5mins until soft. I then added some flagelot beans, just for added texture and to make it into more of a meal, of course leave these out if you like and you’re still left with a delicious filling soup. A bit of salty crispy bacon at the end and you’re done, optional too! Sweat the onion and leeks in the butter over a low heat for 10mins until really soft. Add the garlic, bay leaves and potatoes, stir to coat in the buttery juices and pour in the hot vegetable stock. Simmer for about 15mins until the potatoes are completely soft. Pile the cabbage in, stir and simmer for about 5mins until the cabage is soft. Meanwhile heat a frying pan unti very hot, fry the bacon until golden and crisp. Tip into the soup, with a smuch of the bacony juices as possible. Serve with lots of bread and butter.